Australia’s third largest city, Brisbane is the capital of the beautiful state of Queensland and can be easily discovered by rental car. 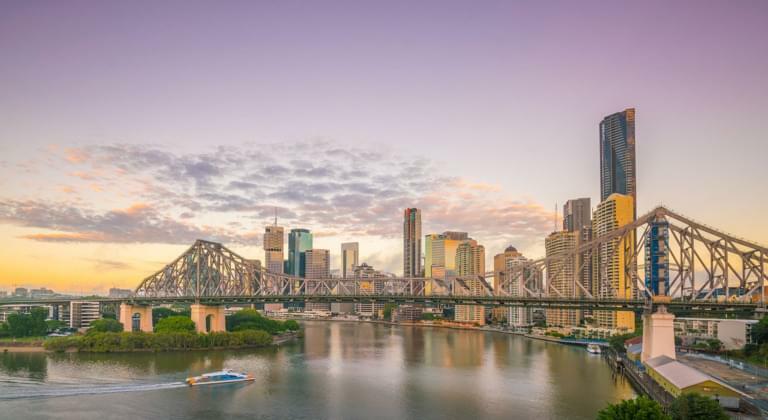 It enjoys a scenic location by the Brisbane River and offers a pleasant blend of historic monuments and all the modern flair of a large metropolis. Brisbane, together with the surrounding state of Queensland, is perfect to explore with a rental car. With Driveboo, you can compare offers of many different rental companies and choose the one that best suits your needs. The mild subtropical climate which prevails in this part of Australia provides the perfect conditions for sightseeing and long trips around the region. Brisbane is also known as a “new world” city, as it relies on environmentally-friendly industry and a clean environment. Where should I rent a car in Brisbane? Due to the city’s size, you will find car rental companies in all areas of Brisbane. However, the most convenient way to find your dream car is to pursue the offerings of one of the car rental companies directly at the airport. The nearest airport to Brisbane is, of course, Brisbane Airport (BNE), located just 17.4 km from the city centre. There, you will find plenty of car hire companies offering diverse options. The companies are located on Level 2 of the International Terminal, as well as on Level 1 of the Domestic Terminal. What are the conditions for booking a rental car in Brisbane? These differ from company to company. Some car rental companies offer a variety of car insurance; however, the safest choice is to opt for full insurance with or without deductibles. This insurance sometimes allows you to additionally register another driver free of charge. Australia follows left-hand traffic. Therefore, if you feel uncomfortable driving on the left, you should practice your skills in less frequented areas. Remember that penalties for road traffic offenses are extremely high in Australia. Thus, you should observe the speed limits at all times. All passengers in the car are required to wear seatbelts. In the case of parking spaces where the car has to be parked perpendicular to the sidewalk, the signs determine the angle at which the car should be parked and whether it has to be facing forwards or backwards. You are not permitted to use your mobile phone while driving. Do I need an international driver's license to rent a car in Brisbane? In some states of Australia, an EU driver's license will be accepted by police and car rental companies (only if it is translated into English!). However, most states require drivers to have an International Licence. Remember, you also have to carry your original driver’s licence with you at all times. Is there wildlife on the roads around Brisbane? You should be on the watch for animals such as kangaroos, wombats, and koalas at all times. What’s more, there are many unfenced roads where cattle will be grazing on the adjoining fields—so you should always drive with caution. Travellers who choose Brisbane as their holiday destination should also consider venturing into the surrounding region. In the area around the city, there are a number of destinations that are worth a day trip. Surfers Paradise with its stunning beaches galore is an ideal choice for those who enjoy outdoor activities. The place is located in the very centre of the scenic Gold Coast. It offers a wide variety of sophisticated restaurants and modern shopping venues. Surfers Paradise is also a great starting point for visiting such theme park attractions as Warner Bros. Movie World. Springbrook National Park is a must-see natural highlight for those who enjoy secluded spaces. The park is full of beautiful waterfalls, volcanic canyons, and eucalyptus trees. Tamborine Mountain is another natural gem not to be missed in the area around Brisbane. It is part of the Gold Coast Hinterland and offers a beautiful balance of cultural heritage and natural wonders. The green and tourist-friendly city of Brisbane offers a plethora of interesting attractions that cannot be missed. If you decide to start your journey around the city from a stroll along the Brisbane River, you should pay a visit to Brisbane’s Cultural Centre, which includes such interesting places as the Queensland Performing Arts Centre, the State Library of Queensland, and the Gallery of Modern Arts. Travellers who enjoy peaceful locations should head towards the Mount Coot-tha Botanic Gardens, which offer stunning views of the whole city. This highlight is located approximately 7 km from Brisbane, but is well worth the journey. Inside, you will find 52 hectares of horticulture and a number of themed gardens. South Bank is another of Brisbane’s must-see tourist attraction. The area is full of promenades, plazas, and parklands which were prepared for the World Expo in 1988. Additionally, you can bathe in the human-made lagoon—a popular pastime activity of Brisbane’s citizens. When in Brisbane, you cannot miss the Story Bridge Adventure Climb. The bridge is one of the city’s most popular attractions. It offers a two-hour tour which guarantees unforgettable views of the city.